You just want to say one word to me. Just one word. You can make it “plastics” if you want, but I’d really like to hear peoples’ best 1-word bit of advice … leave it as a comment. Oh, but why, you ask? 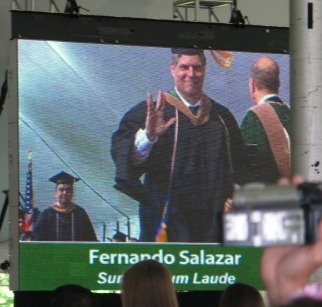 Because yesterday was my graduation – I now have an MBA, from Babson College. It took 3 1/2 years of mostly 2 nights in the classroom each semester and comprised 19 courses, ranging from Accounting & Finance to Negotiations to “Creative Destruction”. Over that time I was part of 7 group projects, and worked with classmates from at least 10 countries (Japan, Peru, Chile, S. Korea, China, India, Pakistan, Germany, Sweden, Spain). It was fun, in a weird way, mainly because of the diversity of the topics. My job is a pretty interesting one, but still it is a single product in a single industry. In the program I did cases and papers on companies ranging from small family businesses, to startups, industrial manufacturing, global conglomerates and technology leaders. But now its done and now I have to apply this learning to the real world. I do wonder about much the same things as younger graduates – where to go and how to get there. I’d love to hear your 1-word advice – or, if you can’t keep it to one word, try for a “Go west, young man!” type of sentence. Between work and school haven’t had much time for blogging. Now as school comes to a close for me (more in a future post) time is free for important stuff – like swords. I own several Japanese swords and recently had my favorite refurbished. In the belief/hope some readers might be interested in the process, here’s a capsule of what was done. Guntō were mass-produced items, though they did come in various grades, stamped and machine forged for NCOs, with progressively better quality for officers of higher rank. (The second image is a rubbing of the tang, with the mei highlighted.) The rust on the tang is blackish-grey and the carving of the mei is somewhat faded. I’ve seen a number of sword tangs made in the 1940’s and this was not like those. Feeling this was a pretty good sword, I wanted it to have better furnishings. Years and years ago I thought I would just make a new scabbard, handle and the rest myself. Now I see that is not practical – maybe if I had 5 years (which I don’t have right now) to learn and practice I could make a passable saya, and then that would only be a portion of what I need. Now this blade is outfitted close to the way that it was 150 or more years ago in the Edo period (I’m sure synthetic suede would have been more than welcome, if they had it). The main thing that remains is the polish. 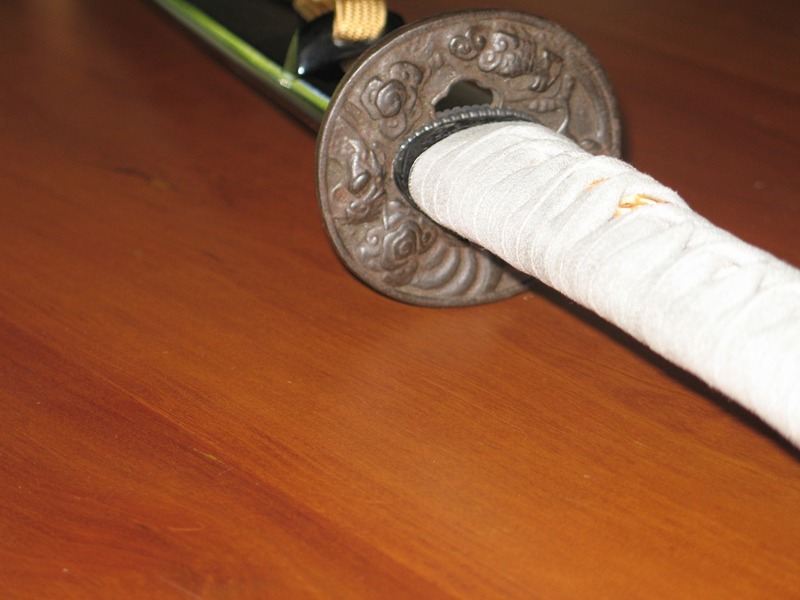 Japanese swords are famous for grained patterns in the steel, which come from folding of the metal during construction, and for the hamon, or “temper line”, the cloudy zone of hard steel that composes the edge of the sword. These can only be seen and appreciated when the sword has been polished – the surface burnished using grinding stones of increasing fineness. My sword, like many that have been in circulation, has been “cleaned”, perhaps with steel wool or something worse, and its polish is completely gone – the surface is hazy with fine scratches. Like making the saya, tsuka and the rest, polishing is not to be undertaken buy the amateur. I’ve contacted a reputable polisher and put my sword on his list – the wait is 2 years. Meanwhile the sword waits in its place on the mantle. Rarely does a day go by where I do not take it out, practice a few cuts, then put it back. Old friends, like old swords, still are trusted best.